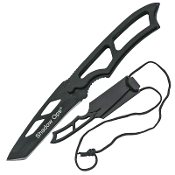 This Shadow Ops Tanto Fixed Blade Neck Knife features a razor sharp 3" stainless steel tanto blade. The blade is full tang for extra strength with black ABS overlays to provide a better grip. Includes ABS molded sheath and nylon paracord lanyard.